On December 26, 1918, the United States Post Office in Greeley was robbed almost without a trace. The robber(s) made off with about $69,300 (equal to about $1,152,430 today) worth of United States war savings stamps. 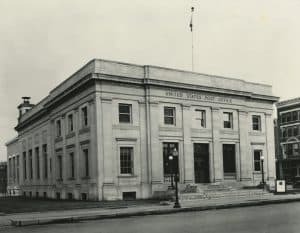 The large granite post office, constructed in 1914, was believed to be almost burglar proof, but became the scene of the third largest theft of a United States post office at the time. United States Post Office in Greeley, built 1914, robbed 1918, razed 1962. Stories relate that the burglar(s) entered the post office at an unknown time during the evening through a basement entrance at the back of the building. The only evidence of forced entry into the building was two hack-sawed padlocks. The safe had been open at the time due to the presence of the Assistant Postmaster, John Harbottle, working in a nearby room along with several clerks sorting the mail. The lights suddenly went out between 8:30 and 9:00 PM, and before they could be turned back on the robber had taken his loot and departed. It was speculated at the time, that the thief or thieves may have used a passageway in the building that was built for post office inspectors to observe employees at work without them knowing. However, due to the extreme lack of evidence, the robber(s) was never caught, and the exact nature of how the crime was perpetrated was never discovered. At the time, a postmaster was responsible for repaying the sum of any losses his or her post office encountered, including robberies. The United States Postal Service had the ability to release the postmaster of liability when the sum was under $10,000. The only way in which a postmaster could be cleared of reimbursing sums that were greater than $10,000 was through an act of the United States Congress. It was not until late in October of 1921 that the first steps were taken to release Postmaster Hubert Reynolds of the liability of the $69,300 stolen from the Greeley Post Office. The House of Representatives moved to pass a bill to this effect on October 28, 1921. Unfortunately for Mr. Reynolds, the bill was not passed at this time due to filibustering tactics. During the ensuing debate, a letter was read that was written and signed by 186 important businessmen and women of Greeley and the surrounding area. The letter vouched for the highly reputable character of Reynolds, along with his excellent work ethic, and stated that the signees believed he should be cleared of any liability for the stolen money. Among the many businesses represented in the letter were the Great Western Sugar Co., Shaw Dry Goods Co., and the Union National Bank. 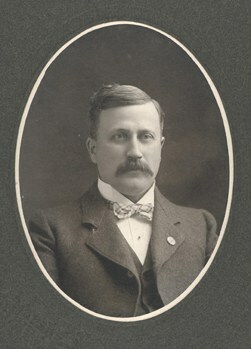 A few of the prominent people who signed were Thomas Macy, F. J. Allnutt, and Charles Hansen (Manager of the Greeley Tribune-Republican at the time). Almost three years after the robbery occurred, in November 1921, Hubert Reynolds was finally cleared of any liability. Reynolds remained postmaster for several more years after the robbery. Hubert Reynolds’ home, originally located at 1117 9th Avenue in Greeley, was relocated to City of Greeley’s Centennial Village Museum. Take a guided tour and learn more about Reynolds’ life when the Village reopens for the season in May, 2019.